Nick Karnazes hits 108 courses in 48 states in 96 days... Teed Off in America! Dreams do come true, even for golfers. Retired from the wholesale food business, Nick Karnazes had one; he fulfilled it. He wanted to make a golfing trek across the United States, from the west coast and back, playing two golf courses in 48 states in 96 days. He was inspired by his son, Dean, an “ultra marathon” man, who competed in 50 marathons in 50 states in 50 days in 2006, and has written several books about distance running. If Dean can do it in his sport, I can do it in mine, Karnazes probably mused. He had asked his wife, Fran, a retired teacher, to accompany him. “She said no 605 times,” Nick reported. She did join him on the last leg of his trip, however, covering the last five states. As a golfer, with 55 years of experience, Nick had played on his El Camino College golf team, and moved on to such courses as the Riviera Country Club and other top southern California courses. At one time, he had a four-handicap. 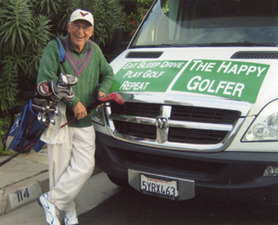 Nowadays, he is regularly seen on his favorite San Clemente and other local golf courses. Often he plays as a single, just to meet other people. “I’d hear their stories and they’d hear mine. I really enjoy meeting people,” Nick said. For 44 years, he has played with a regular foursome of longtime friends: Jim Root (Torrance), Al Herzog (Encinitas), and Bill Gise (Mission Viejo). “Two of them, Jim and Al drove up to Shasta to play my last round of the trip with me,” Nick reported. Nick’s solo golfing adventure started on March 22, 2009; he returned to his San Clemente home, next to the Municipal Golf Course, on June 25. In preparation for walking across America’s golf courses, he carried his golf clubs while striding up and down San Clemente’s beaches – a rather unique sight. Nicknaming himself “The Happy Golfer,” he accomplished his mission and more so. He played on 108 courses within his 96-day time frame. His 24-foot Winnebago, dubbed “The Mother Ship” by son Dean, which served as his traveling locker room during marathons, provided Dad with a mobile kitchen, bathroom, bed, and office. His other son, Kraig, monitored his dad’s progress with a GPS device, accurately guiding Nick from one golf course to another. His introductory email to officials at all the golf courses he intended to play produced return messages of positive acknowledgment and encouragement. The Callaway Golf Company, as a sponsor, equipped him with golf clubs, bag, shoes, hats, raingear, five dozen golf balls and A Happy Golfer website. He had newspaper interviews, radio and television appearances at various locations throughout his trip. Daily, he kept careful statistics of almost every hole he played (hole number, yards, clubs used, approach strokes, putting strokes, score, and comments). He ate and slept well, and encountered no serious driving problems. He parked his RV in campsites and free accommodating parking lots, such as WalMart, where he did most of his shopping. Primarily, it was not golf but other benefits of his unique trip which pleasured him the most. These were the people he met and the courses he played. He has a reminiscent story for every place he played and a claptrap memory in remembering the names of people he encountered, courses he played on and special incidents. The fourth day of his trip in Mesquite, Nevada, he was taken to the hospital for suspected heart trouble. Learning that he hadn’t eaten that day, his doctor fed him three dinners, and, after, spending the night under observation in the hospital, he passed the physician’s 80-yard hallway-walk challenge with 13 completions, and made his morning golf start in Utah. He played in rain, snow, and blistering winds. In Oklahoma City, because of his Callaway connection, he was joined on the course by two professionals who promised to evaluate his game. They agreed to play nine holes and then tell him what they thought of his swing, grip, and stance. 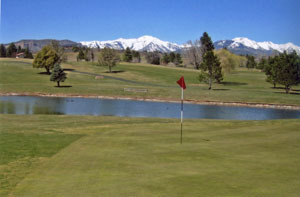 In a KOA campsite in Arizona, due to ice and frozen greens, he took a cart, deciding that he couldn’t walk all the courses as he had intended. In Durango, Colorado, playing with twin brothers, both 6’4” and their hunting friend, Carlos, he had his first energy bar made from an elk Carlos had recently shot. In Chicago, on Veteran’s Day weekend, he joined a group of veterans sponsored by a women’s group who had limbs missing. Meeting them and joining them for a celebratory luncheon, listening to their World War Two and Korean experiences was also one of the trip’s highlights. He spent Greek Easter week in Augusta. He even had a laundry problem before he arrived in Chicago. He had mixed his red clothing with his white clothing. Guess what happened in the wash? Nick’s introductory email, which he sent in February to all the golf courses he planned to visit from March through June, included such information as “I plan to play two 18-hole rounds of golf, in each of the 48 connected United States, in 96 consecutive days. I love golf and have played for 55 years.” He gave a two-day window as to arrival times and included his preferred times (6:30, 7:30, or 11:30 a.m. and 12:30 p.m.) “I normally walk my home course, San Clemente Municipal - Blue T’s 6435 yards in 3 ½ hours.” He asked that he be “comped” or receive a senior or twilight rate as a self sponsor. He finished his message with, “Looking forward to meeting you and playing your course … Sincerely, the happy golfer.” He also attached a copy of his cross country itinerary.